French President Francois Hollande called for “quite strong” autonomy for Ukraine’s eastern regions while speaking on France 2 TV. He also revealed part of the joint plan discussed in Moscow on the conflict’s solution. On Saturday, Hollande said that the eastern Ukrainian regions of Donetsk and Lugansk need “rather strong” autonomy from Kiev. “These people have gone to war," Hollande explained. "It will be difficult to make them share a common life [with Kiev]." The French President also revealed part of the joint document under negotiation between Berlin, Moscow, Paris and Kiev. He said it will feature a 50- to 70-kilometer demilitarized zone on each side of the current line dividing militia-held and Kiev-controlled territories. The revelation comes after German Chancellor Angela Merkel and French President Francois Hollande discussed the situation with the Ukrainian president on Thursday and came to Moscow on Friday to meet President Vladimir Putin. The talks lasted nearly five hours and were characterized as 'constructive' by all sides. As a result, a possible joint document is in progress on the implementation of the Minsk agreements signed in September last year, Kremlin spokesman Dmitry Peskov said. The document “would include proposals made by Ukrainian President Poroshenko and suggestions put forward today by Russian President Putin,” Peskov told journalists on Friday. #Lavrov "Moscow wants to see dialogue between Kiev and Donetsk." Following the Moscow talks, Hollande described the negotiations with Putin as “one of the last chances” for peace. "If we don't find not just a compromise but a lasting peace agreement, we know perfectly well what the scenario will be. 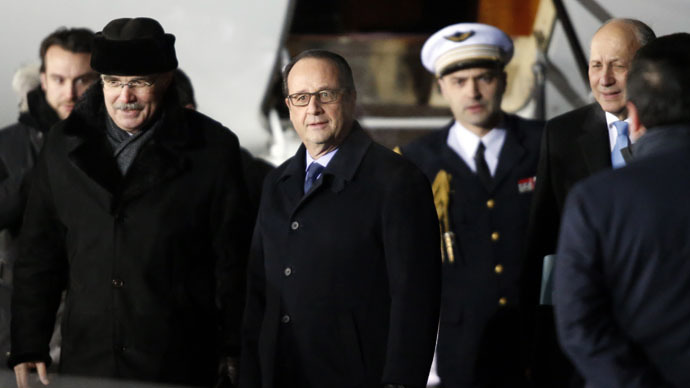 It has a name… it's called war," Hollande told journalists on Saturday. In turn Merkel reiterated, at the annual Munich Security Conference on Saturday, that the Ukrainian crisis “cannot be resolved militarily,” so the talks are definitely worth pursuing. Moscow will persist in pursuing the peace process promoting the “withdrawal of heavy weapons and initiating direct talks between Kiev and the militia in the Donetsk and Lugansk regions,”said Russian Foreign Minister Sergey Lavrov at the Munich conference. Russia, Germany and France are ready to become guarantors of the agreements that could be achieved, he added. EU and US policies drift apart over Ukraine? His statements come as the US mulls weapons supplies to Kiev. US State Secretary John Kerry visited Ukraine on Thursday. Speaking at a media conference in Kiev, he said that US President Barack Obama will take the decision whether to supply lethal aid next week. This has caused widespread concern in the European capitals. Alexander Clackson, founder of the Global Political Insight think tank, believes that previous examples of the West supplying weapons to conflict zones demonstrate how they have brought only escalated tensions. “They [the US] were supplying weapons in Afghanistan, when Russia was at war with Afghanistan, to Al-Qaeda, they have been doing it with the Syrian rebels, a lot of whom have now joined ISIS. It is a strategy that hasn’t worked in the past and actually created many problems. So you can understand, why Europe is worried about this move,” he told RT. The widening rift between the polies of US and EU towards the Ukrainian crisis has been noticed by critics who say that the European leaders are strongly in favor of pushing away the obstacles to solving the conflict. “There is a certain belief now that the interests of Europe and the US don’t necessarily match when it comes to Ukraine. If you look at, for example, at the fact that the America is looking to supply weapons to Ukraine, that move would go completely against anything that Europe would want,” Clackson said. “German Chancellor Angela Merkel has spoken quite clearly about the fact that it would not be the right move, and, of course, other European states have followed her suit in saying that. It is completely understandable why – supplying weapons to Ukraine, which is in Europe, would enflame the conflict even further and lead to a potential confrontation, a direct confrontation with Russia between Ukraine, and Russia, which may then involve NATO, and therefore Europe,” he added. Martin Sieff, columnist for the Post-Examiner newspaper, also said that Washington does not seem to want to end the conflict promptly. “President Hollande, Chancellor Merkel seem to have a much greater sense of responsibility about the importance of getting a quick ceasefire and new negotiating framework or restore negotiating framework on the Minsk process in place. One does not sense the same sense of urgency in Washington,” Sieff told RT. On Saturday, Lavrov blamed Washington for taking steps that “only promoted further aggravation of the situation” in Ukraine. He also said that the West has been instigating the conflict and “indulging Kiev in its military operation”. “We cannot understand why in Afghanistan, Yemen and Mali, the West is calling on the governments to hold talks with the opposition, in some cases even with extremists, whereas in regard to the Ukrainian crisis, the West is indulging Kiev in its military operation,” Lavrov said. UK political analyst and author Dan Glazebrook told RT that the US and Britain have been constantly “sabotaging” the peace deal in Ukraine and instigating Kiev to reject negotiations. The UK Prime Minister David Cameron has been fiercely criticized at home for not participating in the Merkel-Hollande initiative. “The UK is a major NATO member, it is a major EU member, it is a member of the UN Security Council, and it is unfortunate that the weight that the British Prime Minister could bring to efforts to resolve this crisis appear to be absent,” General Sir Richard Shirreff told BBC Radio 4’s Today programme on Friday.